Black pepper essential oil (Piper nigrum) is steam-distilled from the berries (peppercorn) of the Piperceae. 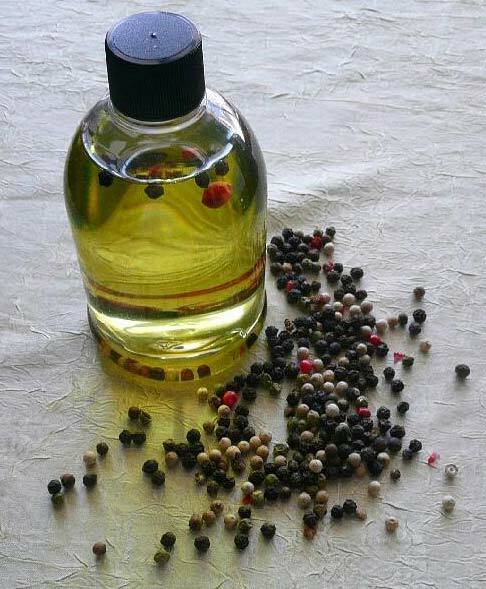 Although black pepper itself is frequently used, the oil is not so widely known. However, it's an oil high in monoterpenes, a chemical constituent know to have a powerful impact on the body in many ways. The aroma of black pepper is spicy, musky, warm, and peppery. Therapeutically, black pepper oil is mostly used as a supplement for digestive and nervous system support and wellness. For this reason many people will use the oil as a flavoring in their cooking, just as you might with crushed black pepper. Its Botanical Name is Piper nigru. Blends With : Bergamot, clove, coriander, clary sage, fennel, geranium, ginger, frankincense, grapefruit, juniper, lavender, lemon, mandarin, lime, sage, sandalwood & ylang-ylang. Constituents : Limonene, Myrcene, Pinene, Phellandrene, Beta-bisabolene, Beta-caryophyllene, Sabinene, Pinocarveol, Linalol, Alpha, Camphene, Terpineol, Alpha and Terpenene. Benefits : The benefits of black pepper essential oil Digestive, Antispasmodic, Carminative, Aperient, Antirheumatic & Anti-arthritic, Diaphoretic & Diuretic, Antioxidant and Antibacterial. Aromatic Description - Crisp, fresh, peppercorn aroma. Black Pepper Oil Uses : Black pepper oil is used for the treatment of rheumatism, pain relief, chills, colds, flu, increase circulation, muscular aches, exhaustion, physical & emotional coldness, nerve tonic and fevers. It also helps in increasing flow of saliva, stimulates appetite, tones the colon muscles, encourages peristalsis and is also used as a general digestive tonic.